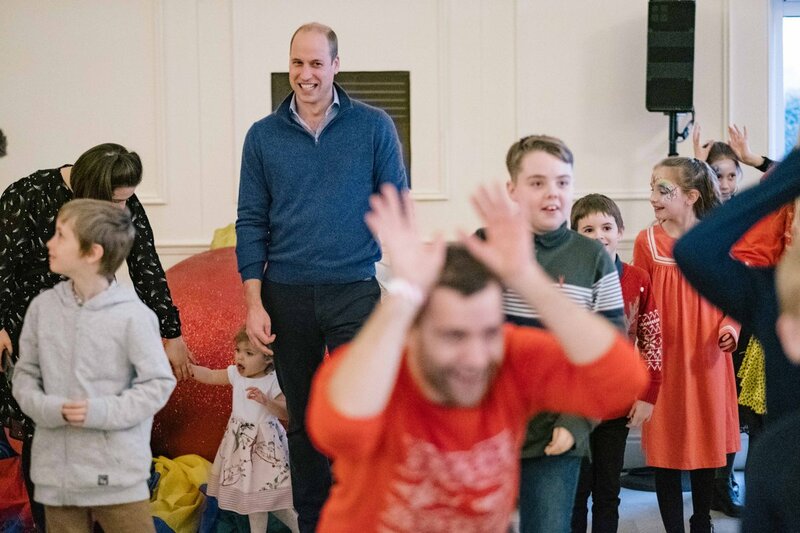 Today the Duke and Duchess of Cambridge, Prince William and Catherine, hosted a Christmas Party at the orangery of Kensington Palace for the families and children of military personnel from RAF Coningsby and RAF Marham serving in Cyprus over the festive period. 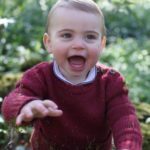 Ahead of the party the Palace said, “Their Royal Highnesses wish to deliver a message of support to deployed personnel and to acknowledge the fact that many Serving personnel are away from their families at this time of the year”. 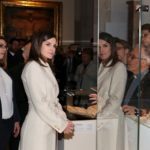 The event was support by the Royal British Legion in recognition of the unique contribution and sacrifices serving personnel and their families make year-round, and especially when they are separated during the festive period. The party was a fun event where a snow machine was rented. 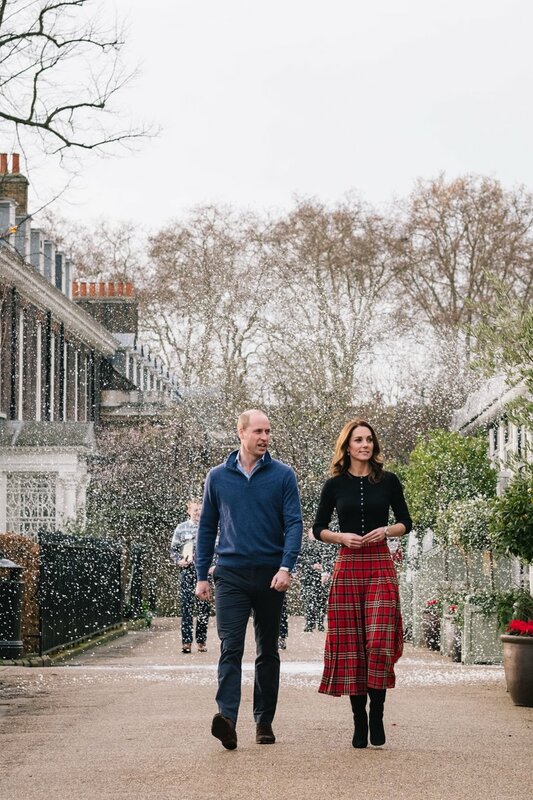 It seems the fake snow gave a small start to Duchess making the couple cackle when they took a short walk from their home to Kensington Palace Orangery. 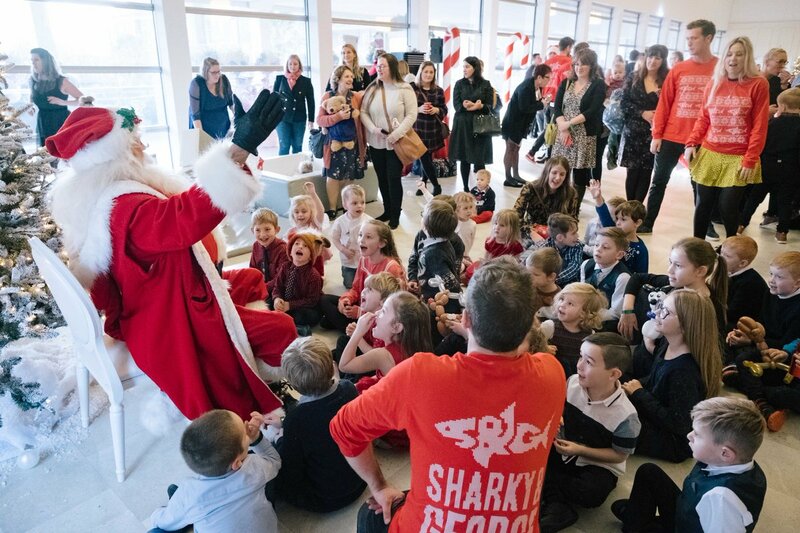 Children enjoyed many events organized by the British party planners Sharky and George that included decorating stockings or snow globes, making crackers andcreating Christmas party kits. 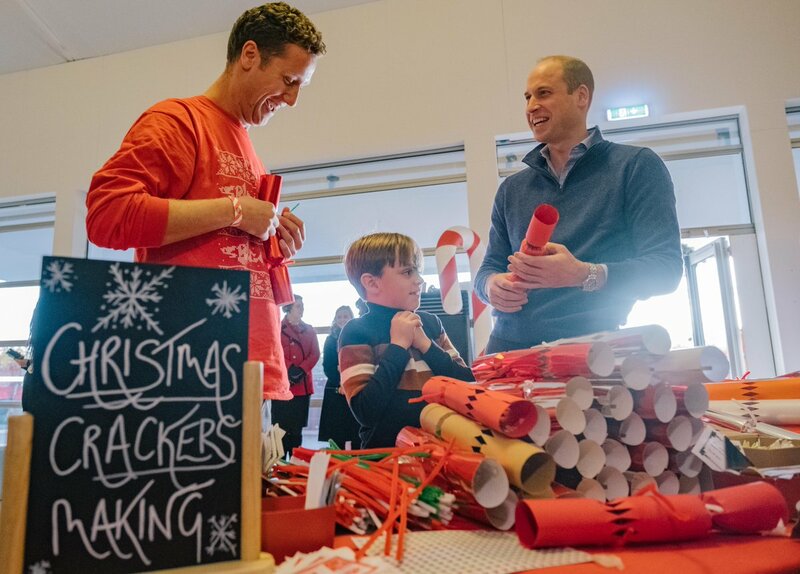 Prince William learning how to make crackers. The party area was decorated with Christmas trees and much to children’s joy there was a Santa Claus. There was a photo booth and a post box where guests took pictures and send messages to their loved ones in Cyprus. 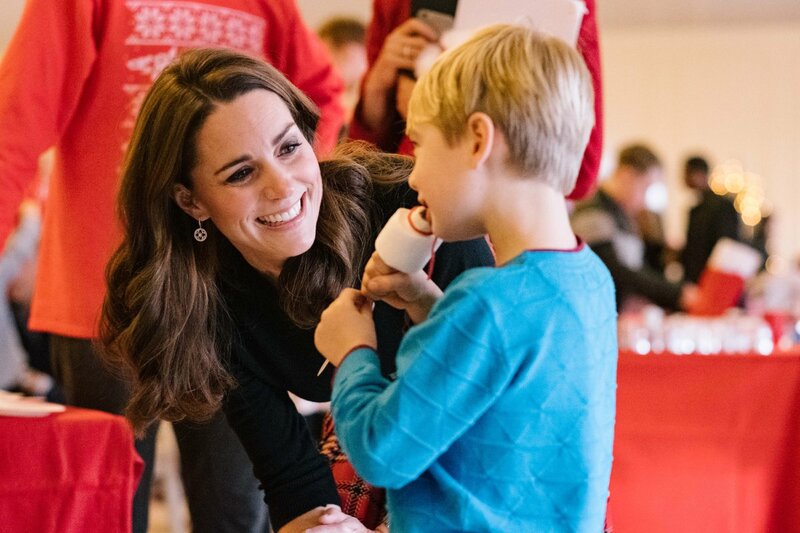 From the Telegraph, “Asking children to bring any presents or letters they would like to give their mothers and fathers serving overseas, the Duke and Duchess will gather them from a special post box to hand deliver tomorrow. On Wednesday morning, they will fly to RAF Akrotiri in Cyprus, where military personnel from RAF Coningsby and RAF Marham are deployed to support Op Shader, the UK’s contribution to the ongoing campaign against Isis. 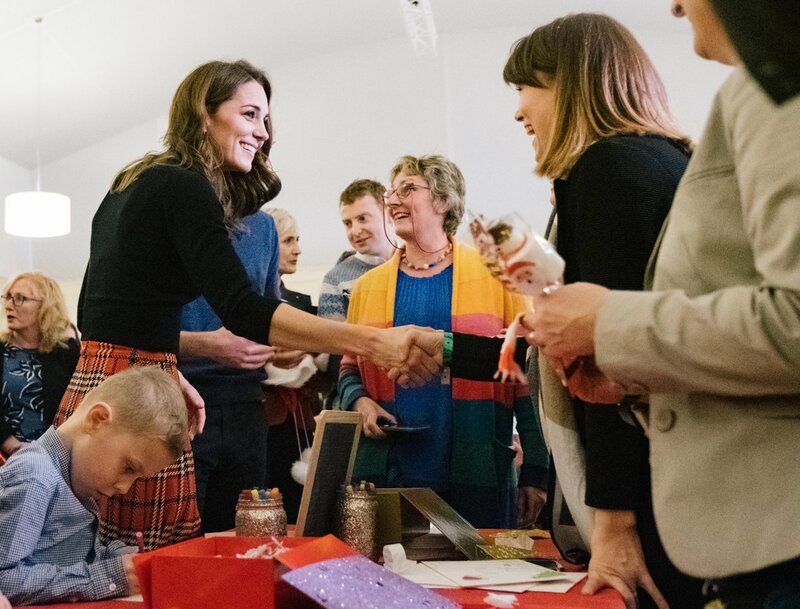 There, they will personally hand over letters and gifts from children to their parents, delivering a message of thanks for their service throughout the Christmas period”. During the party Catherine, who is mother of three kids, played with toddlers. 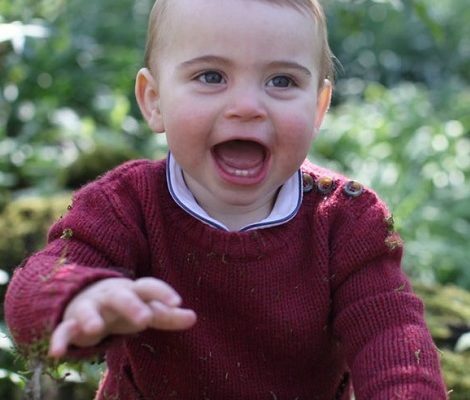 This photograph is simply precious. A video of the departure where Catherine’s Personal Secretary Catherine Quinn was also having fun. 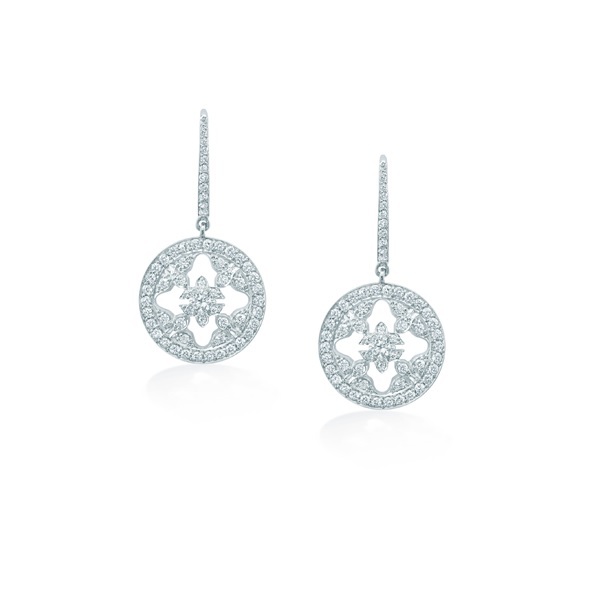 For the party Duchess stepping away from her formal look chose a very lovely festive dressed down look. 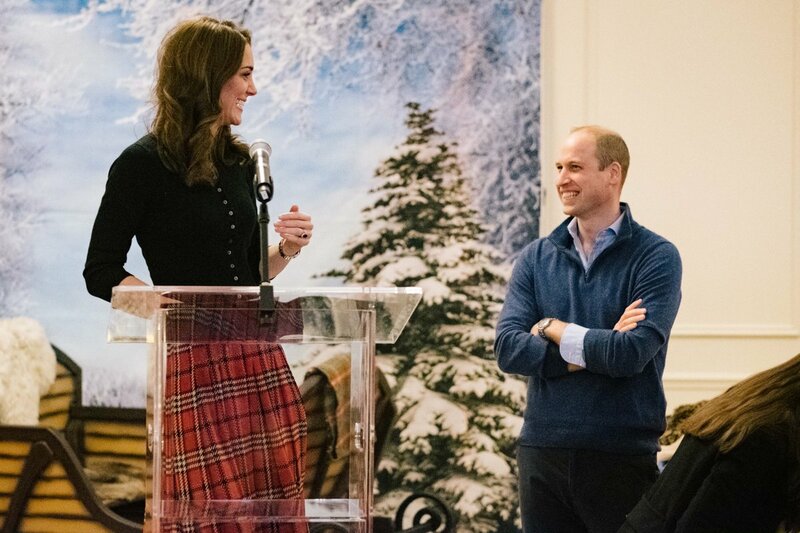 Catherine wore a black button down cashmere top from Scottish cashmere firm Brora. 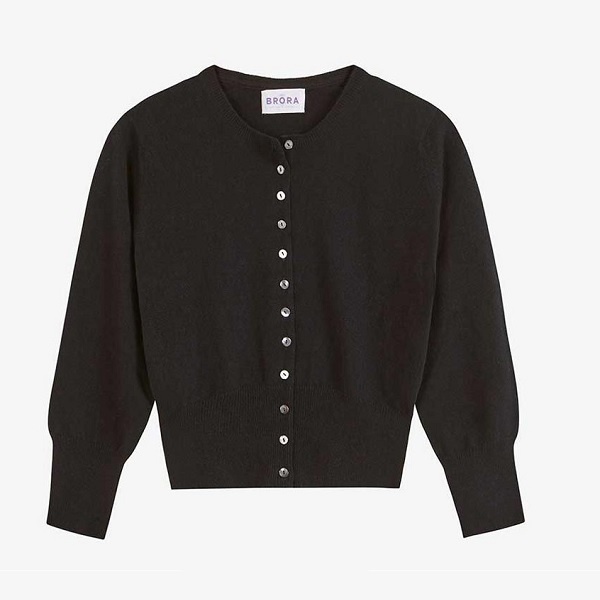 It was label’s cropped cardigan in black. 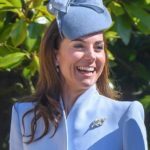 The $375 cardigan is described as, “Designed to accentuate a smaller waist, this neat knit is the perfect, feminine cover up for tea dresses, midi skirts and high waist trousers“. The cardigan is available in four colourways: White, Black, French Navy and Swan. Crafted from two-ply Scottish cashmere the top featured round neck with ribbed trim, three quarted sleeves with ribbed cuffs and cropped length neat fit. 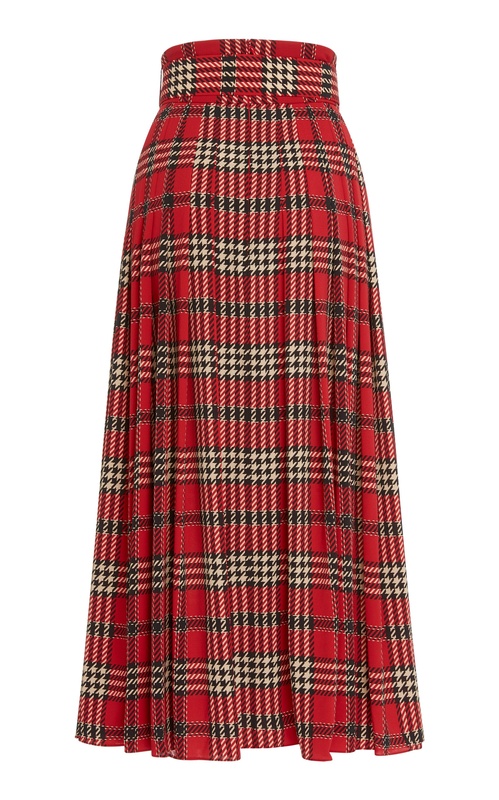 Catherine paired the top with a festive red Emilia Wickstead Pris Pleated Tartan Flannelskirt. 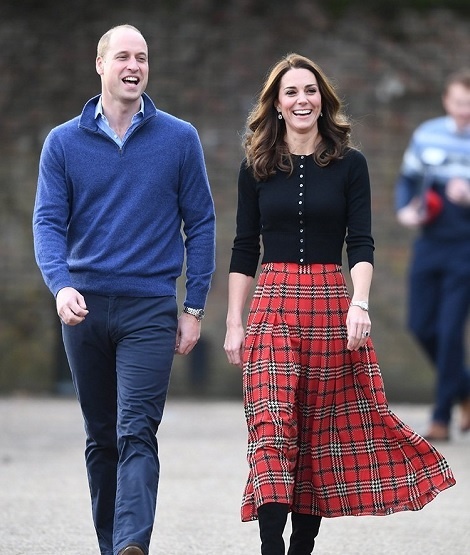 The skirt was from label’s Autumn-Winter 2018 collection that was inspired from 1970’s film ‘Love Story’. The skirt was described as, “Pris’ skirt is cut in an a-line silhouette from sturdy flannel that has sharp knife pleats throughout. 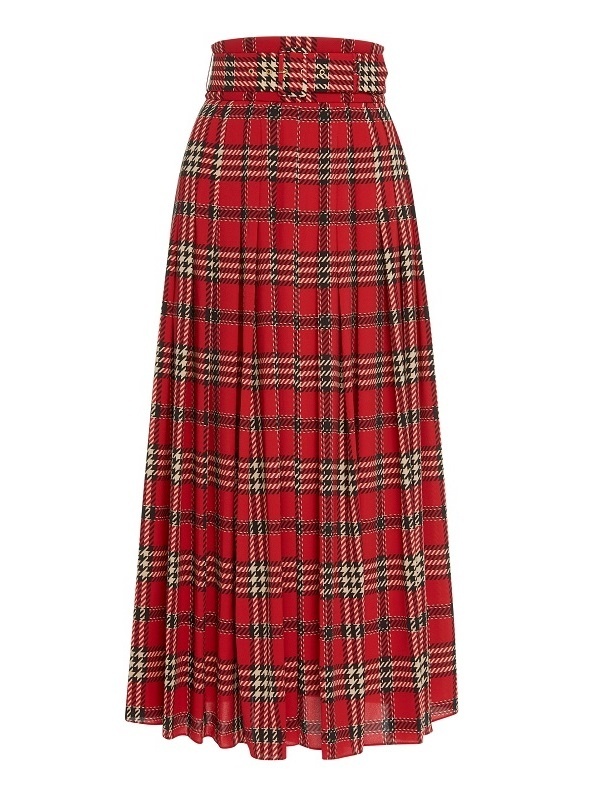 Cinched with a belted waist, its designed in classic tartan check“. A closer look at the skirt’s print. Crafted from Polyster and elastane the pleated skirt has a buckle-fastening at front. 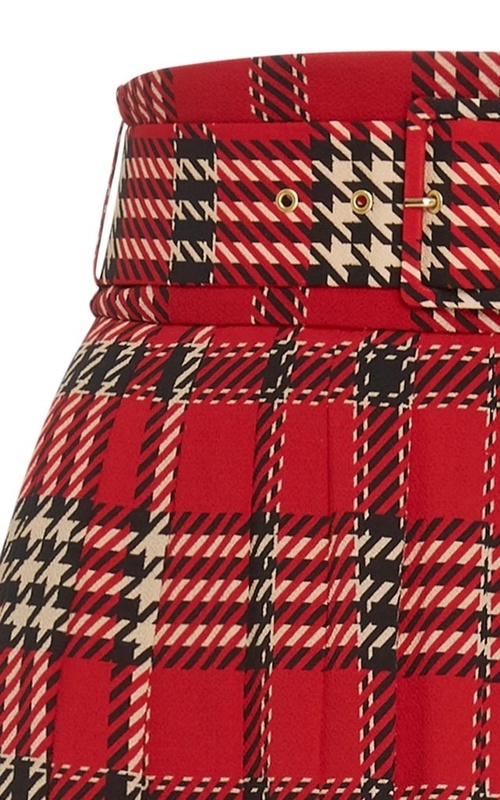 The Multi-colour tartan skirt originally retailed for $1295 before going on selling out at $777. 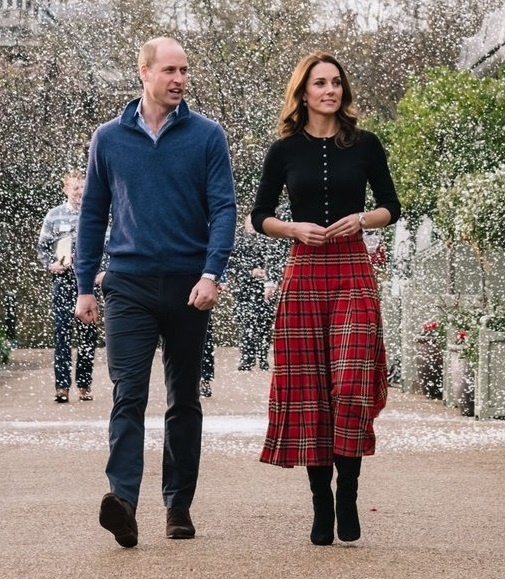 Susan from WhatKateWore noted that the tartan pattern used in Catherine’s skirt is available in this pleated tartan dress. Catherine was wearing a new pair of suede Pointy-toe boots. I will update the post once they are identified. 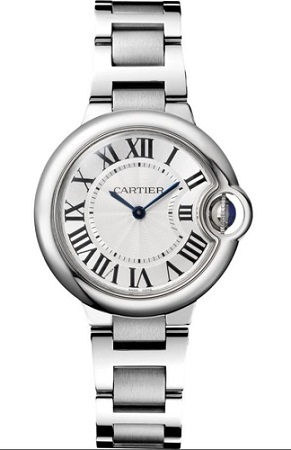 Her Mapping & Webb Empress earrings finished the look along with Cartier Ballon Bleu watch. 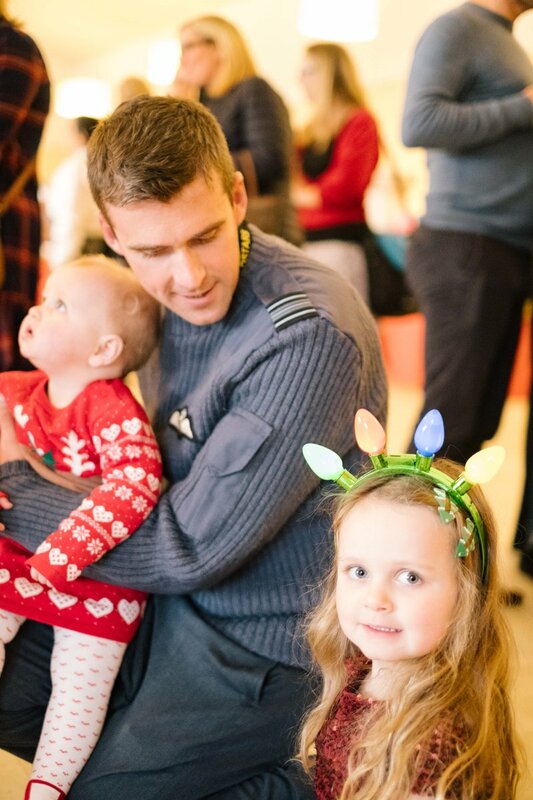 Tomorrow the couple fly to RAF Akrotiri in Cyprus to meet with Serving personnel, families living on the base, wider station personnel and members of the local community. RAF Akrotiri is the home of the Cyprus Operations Support Unit which provides joint support to British Forces Cyprus and operations in the region to protect the UK’s strategic interests. 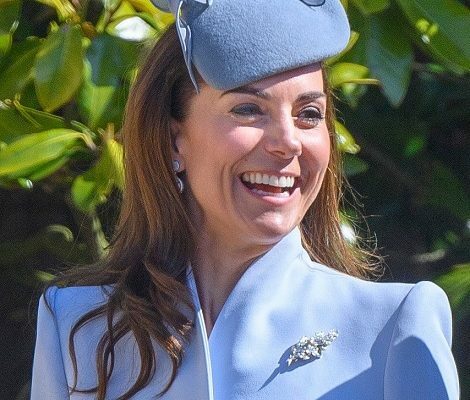 Later tonight, Queen Elizabeth II will host annual Diplomatic Corps Reception at the Buckingham Palace. William and Catherine have attended in the past, so they might attend tonight also.